In the recently published study, the market research institute Ceresana comprehensively analyzes and describes the development of the global market for styrene. This market report covers all relevant data and facts regarding styrene market trends, market size and market growth. Styrene is an important product in the petrochemical industry and used to manufacture a broad range of day-to-day products. The importance of styrene is reflected by the revenues generated with this product: market value amounted to about US$41.8 billion in 2012. About 40% of the styrene consumed worldwide in 2012 were processed into polystyrene (PS). Polystyrene (PS) is used in the manufacturing of food packaging as well as electrical and electronic devices. The global economy will continue to recover during the next few years and thus provide the general framework for a moderate increase of demand for this type of plastic. Yet demand for polystyrene will not increase as dynamically as demand for other standard plastics due to a change in technologies and advancing substitution processes. Market researchers at Ceresana forecast global demand for styrene in the production of polystyrene (PS) to rise by, on average, 2.3% per year. The second largest sales market is the production of expandable polystyrene (EPS), which is used as insulation material in new residential units and the refurbishment of old buildings, among others. Styrene based engineering plastics such as acrylonitrile-butadiene-styrene (ABS) are used by, e.g., the automotive and electronics industry, while styrene-butadiene rubber (SBR) is processed into tires. Styrene-butadiene latex (SBL) is utilized in carpets and paper coatings. Another application is the manufacturing of unsaturated polyester resins (UPR), which are processed into fiberglass suitable for automotive bodyworks and naval vessels due to its rigidity. According to the analyses of Ceresana, the production of acrylonitrile-butadiene-styrene (ABS) and expandable polystyrene (EPS) will provide the largest stimuli to growth in the future. Demand in these segments is projected to increase by 4.1% and 3.8% p.a. respectively until 2020. While the ABS industry is still in the initial stages in many emerging countries with excellent growth prospects, producers of EPS in several industrialized countries are able to profit from state-subsidies targeted at increasing energy efficiency. Even on saturated markets, this can provide growth impulses. In the end, consumption of styrene depends on the demand of consumers for the different styrene based products. Thus, emerging countries exhibiting strong economic growth and a rising income offer a considerable potential. Conditions as propitious as these attract investment in the expansion of the downstream styrene industry. On the long term, this will lead to an establishing of an ever larger part of the value creation chain in these countries. As result, demand for styrene in some countries will rise significantly. An example for a development of this kind was and is China. In the past eight years, demand for styrene in this country rose by 9.6% per year. Thus, China is the worldwide largest sales market, accounting for about 31.5% of market shares in 2012. The USA followed at a considerable distance, after demand for styrene fell by, on average, 1.9% p.a. since 2004. Global production of styrene is increasingly relocating to emerging countries, while developed industrialized regions reduced capacities considerably in the last few years, especially Western Europe and the USA. This shift was triggered by a previous excessive increase of production capacity at a time when demand for styrene rose at less dynamic rates or even declined in the aftermath of the global economic crisis. An effect of this process was the decline of global capacity utilization to 75% in 2009. While production capacities were relocated, degree of global capacity utilization rose again. This development is likely to continue; we forecast the highest relative increase of styrene production until 2020 to occur in South America and the Middle East. The production capacity in these countries with extensive crude oil resources will increase to approx. 4.8 million tonnes in 2020. Ceresana expects output in South America to increase by, on average, 13.4% p.a. during the next eight years. 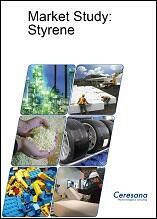 Chapter 1 is a description and analysis of the global market for styrene. Demand, revenues, and production are explained in detail. Additionally, data on existing and future production capacities is provided. This report also offers an extensive insight into the development in individual countries and regions. Chapter 2 examines the 23 largest countries of the market in more detail and provides information on demand, revenues, production, import, and export of styrene as well as current and future capacities. Demand for styrene is analyzed in detail split by the applications production of polystyrene (PS), expandable polystyrene (EPS), acrylonitrile-butadiene-styrene (ABS)/styrene-acrylonitrile (SAN), styrene-butadiene rubber (SBR)/styrene-butadiene latex (SBL), and Other Applications. Chapter 3 provides a detailed analysis of applications for styrene, e.g. its use in the manufacturing of polystyrene and in other applications. This study contains data on demand development split by Western Europe, Eastern Europe, North America, South America, Asia-Pacific, and the Middle East/Africa as well as consumption figures for individual countries in these regions. Chapter 4 provides a useful directory of producers, clearly arranged according to contact details, turnover, profit, product range, production sites, profile summary, product-specific information as well as existing and future capacities at individual production sites. Extensive profiles of 67 manufacturers have been compiled, including Styrolution Group GmbH, SINOPEC Corp., Total SA, Styron LLC, PetroChina Company Limited, Royal Dutch Shell PLC, Formosa Plastics Group (FPG), Saudi Basic Industries Corporation (SABIC), and Americas Styrenics LLC. (Note: Profiles are assigned to the country in which the company or holding is headquartered. Company profiles also include joint ventures and subsidiaries).